A paper recently published in Global Environmental Change by Brysse et al. (2012) examined a number of past predictions made by climate scientists, and found that that they have tended to be too conservative in their projections of the impacts of climate change. The authors thus suggest that climate scientists are biased toward overly cautious estimates, erring on the side of less rather than more alarming predictions, which they call "erring on the side of least drama" (ESLD). In this paper, Brysse et al. examined research evaluating past climate projections, and considered the pressures which might cause climate scientists to ESLD. 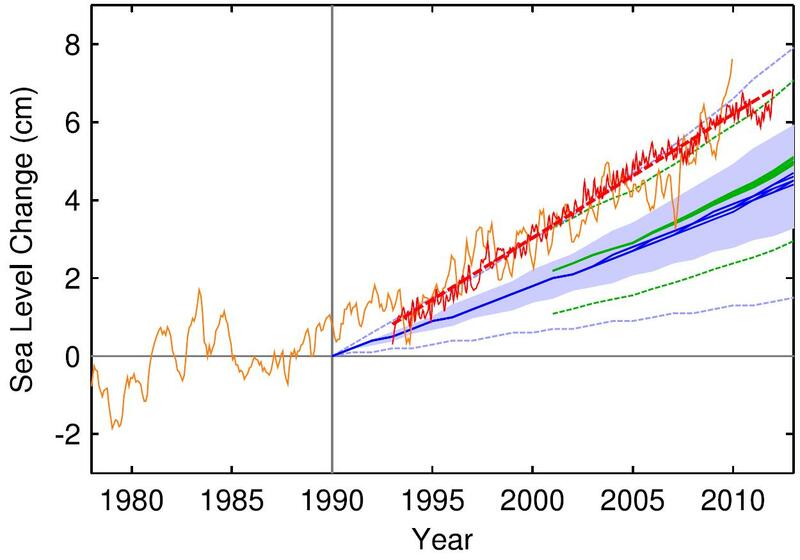 "The satellite-based linear trend 1993–2011 is 3.2 ± 0.5 mm yr-1, which is 60% faster than the best IPCC estimate of 2.0 mm yr-1 for the same interval"
Figure 1: Sea level measured by satellite altimeter (red with linear trend line; AVISO data from Centre National d’Etudes Spatiales) and reconstructed from tide gauges (orange, monthly data from Church and White 2011). Tide gauge data were aligned to give the same mean during 1993–2010 as the altimeter data. 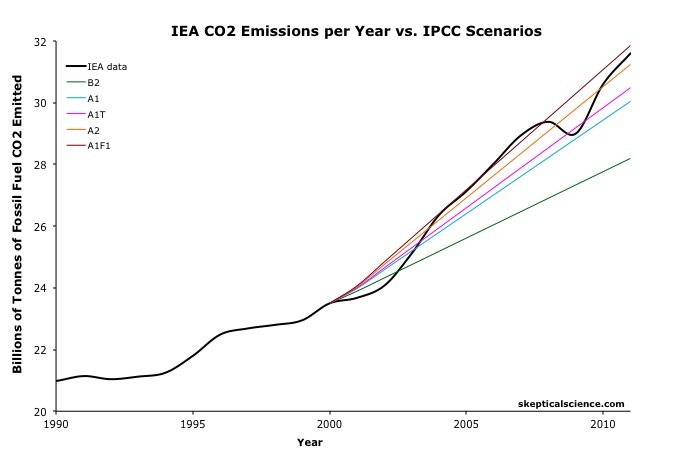 The scenarios of the IPCC are again shown in blue (third assessment) and green (fourth assessment); the former have been published starting in the year 1990 and the latter from 2000. The main reason these sea level rise projections have been too low and that the IPCC almost certainly underestimates future sea level rise is that their models do not include the effects of dynamic ice processes from chunks of ice breaking off into the ocean ("calving"), then melting. The IPCC approach in attempting to account for these processes considers recent contributions to sea level rise from ice sheet melt, then "assume that this contribution will persist unchanged." This is certainly a conservative approach, and the primary reason their sea level projections have been low. Three years after the IPCC Fourth Assessment Report was drafted, the 2009 Copenhagen Diagnosis examined the latest climate research to effectively update the IPCC report. In addition to confirming the Rahmstorf finding that the IPCC has underestimated sea level rise, the Copenhagen Diagnosis also found that the IPCC has dramatically understimated the decline in Arctic sea ice extent (Figure 2). A 2009 report by the US National Research Council (NRC), Committee on Strategic Advice on the U.S. Climate Change Science Program found that the IPCC had also underestimated recent CO2 emissions from developing countries. "The IPCC projections are based on estimates that CO2 emissions in China increased at an annual rate of about 3 to 4 percent during the past 10 years (IPCC, 2007a; IEA, 2007), but a subsequent province-based inventory concluded that emissions actually increased at a higher rate of about 10 to 11 percent (Auffhammer and Carson, 2008)....Emissions from a number of other developed countries were also higher than agreed-to targets." The Copenhagen Diagnosis notes that the global warming amplification (feedback) from carbon released as a result of permafrost melting has not been accounted for in any of the IPCC projections. A recent UN Environment Programme report warned that failing to account for this feedback will result in an underestimate of future warming. The NRC report notes that according to Déry and Brown (2007), northern hemisphere snow cover may also be declining at a faster-than-expected rate, and the Copenhagen Diagnosis states that rainfall has become more intense in already rainy areas, and "recent changes have occurred faster than predicted". So while the IPCC and the climate science community in general has under-predicted quite a few climate impacts, there are very few examples where they have over-predicted these changes. The IPCC and climate scientists are often accused of "alarmism", but clearly Brysse et al. demonstrates that these accusations are wholly unfounded and misplaced. "Our analysis of the available studies suggests that if a bias is operative in the work of climate scientists, it is in the direction of under-predicting, rather than over-predicting, the rate and extent of anthropogenic climate change." In fact, Brysse et al. suggest that these frequent accusations of "alarmism" and other climate contrarian attacks on climate scientists may be one reason why climate scientists have under-predicted climate change, or erred on the side of least drama. "The frequent attacks on Stephen Schneider—as well as attacks on other climate scientists such as Benjamin Santer and Michael Mann—suggests that one possible reason why scientists may have underestimated the threat of anthropogenic warming is the fear that if they don’t, they will be accused by contrarians (as was Schneider) of being alarmist fear-mongers. That is to say, pressure from skeptics and contrarians and the risk of being accused of alarmism may have caused scientists to understate their results." However, Brysse et al. note that from a scientific and statistical standpoint, under-predicting an effect by 10% is no less wrong than over-predicting an effect by 10%. Therefore, ESLD can introduce a systematic bias that leads to a reduction in the accuracy of climate projections. Between 2008 and 2011, Brysse et al. conducted a series of interviews with numerous scientists studying and assessing ozone depletion. In February of 1992, NASA scientists studying the Arctic atmosphere issued a press release warning that a major Arctic ozone hole, like the one over Antarctica, could develop that spring. While the science behind the prediction was correct, unexpected factors intervened, and Arctic ozone depletion in 1992 was not as severe as the scientists anticipated. "In the aftermath of the unrealized 1992 Arctic ozone hole prediction, NASA scientists were severely criticized in the conservative press for crying wolf, causing unnecessary panic, and acting according to emotional imperatives or an environmental agenda instead of according to the dictates of scientific objectivity." Subsequent to the barrage of criticism over this event, NASA has become more cautious in issuing press releases. Many scientists who researched ozone depletion have now become involved in the IPCC reports. In an interview in 2009, ozone researcher Jonathan Shanklin suggested that scientific assessments operate according to the "crying wolf principle: if you cry wolf too often, then nobody believes you anymore, and the sky does fall in", and also suggested that in the case of recent IPCC predictions of future climate change, scientists’ "best guess for many of these [scenarios] were actually worse than those in the report." In other words, Shanklin suggests that the IPCC under-predicts climate impacts in order to avoid losing credibility due to ...accusations of "alarmism". Other scientists interviewed by Brysse who were involved in ozone research and the IPCC reports shared similar opinions. In addition to fear of being labeled as "alarmist" Brysse et al. discusses other possible causes of ESLD. For example, scientists tend to invoke the "principle of least astonishment", whereby they typically choose the simplest of two possible hypotheses. However, the rate that climate impacts like Arctic sea loss and sea level rise are occurring and will occur is rather astonishing. Similarly, scientific conservatism introduces "an inherent bias in favor of existing knowledge and presumptions, and the avoidance of conclusions that seem excessively dramatic." Brysse et al. also believe "that the basic, core values of scientific rationality contribute to an unintended bias against dramatic outcomes...scientists are skeptical of all new claims, and ceteris paribus, the more dramatic the claim, the more skeptical they are likely to be." Dramatic claims open scientists to criticisms not just from climate contrarians, but to their own peers as well. and because dramatic claims open scientists to criticism from their peers. However, the conservative bias imposed by ESLD produces a dangerous result. "If climate scientists and assessors are erring on the side of least drama in their predictions, then they are not preparing policymakers and the public for the worst, because they are underpredicting what the worst outcomes might be." We will give the final word to Brysse et al. "Our hypothesis of ESLD is not meant as a criticism of scientists. The culture of science has in most respects served humanity very well. Rather, ESLD provides a context for interpreting scientists’ assessments of risk-laden situations, a challenge faced by the public and policy-makers. In attempting to avoid drama, the scientific community may be biasing its own work—a bias that needs to be appreciated because it could prevent the full recognition, articulation, and acknowledgment of dramatic natural phenomena that may, in fact, be occurring. After all, some phenomena in nature are dramatic. If the drama arises primarily from social, political, or economic impacts, then it is crucial that the associated risk be understood fully, and not discounted." Note: the Brysse et al. results have been incorporated into the rebuttal to the myth that the IPCC is alarmist. Thank you very much for this very interesting article. It helps a lot to understand the climate scientist attitude facing climate change. I hope to have time to translate it in french. James Hansen warned about this problem back in 2007. Dr. Hansen often leads the pack in pointing out the actual problem. Unfortunately, he thinks the situation is worse than the IPCC reports. It will be interesting to see what the next IPCC report says about this publication. It's for this reason I feel that if AR5 isn't strenuously worded in the most vehement terms, and if governments don't finally stand up in response and act with serious intent, all future assessment reports will simply become catalogues of humanity's path to civilisation collapse and ecological blitskrieg. The herd really needs to wake up. Amen, Bernard J, at @3. The more I read and study this issue, the more deeply concerned I become, and even being an earth scientist, I think a *loud* clarion call is needed. The 'herd,' as you perfectly put it, is simply content to go along to get along. Cornel West, on Tavis Smiley recently, said essentially the same thing. In many ways, we at a climatological 1967, a real turnign point, where what we do--we, extended to all of Western civilisation--is goign to be harshly judged by future generations, if we fail to do the right thing. Martin Luther King once quipped, it's always the right time to do the right thing. The right thing is to keep on battling back the misinformers and telling this story to all. You Martin Luther King quote reminds me of Winston Churchill's remark that America always does the right thing - after it has tried everything else. Let's hope that time has come around again. With American leadership, action on climate change has a good shot. Without it, we are probably screwed. They say the most tragic thing about humankind is its inability to understand the exponential function. This IPCC prediction-bias may in part be an example of 'linear thinking' at work. ubrew12, you are most assuredly correct: This video series is one I refer people to, all the time, in order to correct their poor understanding of the exponential function. Authors’ note: Science fiction writers construct an imaginary future; historians attempt to reconstruct the past. Ultimately, both are seeking to understand the present. In this essay, we blend the two genres to imagine a future historian looking back on a past that is our present and (possible) future. The occasion is the tercentenary of the end of Western culture (1540–2073); the dilemma being addressed is how we–the children of the Enlightenment–failed to act on robust information about climate change and knowledge of the damaging events that were about to unfold. Our historian concludes that a second Dark Age had fallen on Western civilization, in which denial and self-deception, rooted in an ideological taxation on “free”markets, disabled the world’s powerful nations in the face of tragedy. Moreover, the scientists who best understood the problem were hamstrung by their own cultural practices, which demanded an excessively stringent standard for accepting claims of any kind–even those involving imminent threats. Here, our future historian, living in the Second People’s Republic of China, recounts the events of the Period of the Penumbra (1988–2073) that led to the Great Collapse and Mass Migration (2074). Sorry to spoil the good vibe, but if the past is anything like prologue, the next IPCC report is not likely to be strongly worded. The process does not allow for that, I think. The strong words have to come from us scientists directly, more actively than passively as has been mostly the case. In addition, people who, like my better half, don't like to hear or see doom and gloom, and the mainstream press of course, would have to finally wake up to this unprecedented challenge ... sooo, not remotely likely to happen (at least in the US). I cannot read the Oreskes&Conway article from this wireless, but I venture to say its contents may be viewed as ... "prophetic"? It is hard to "do the right thing" when you do not know what the future brings. These days it feels even harder although (because?) we do know what the future brings. Alas, I think it will get much much worse before humanity collectively works on the solution, which is why humanity will survive, but society as we know it definitely not. And as Naomi Klein wrote, that is a, if not the main reason the denier movement exists. They fight a fight against physics they cannot win, ultimately, and unequivocally, destroying along the way the very thing they care most about. Go figure. When I was in West Va for a mountaintop removal mining shutdown protest, the miners (in a very suspiciously well-organized terroristic counter-demonstration) would shout at us things like, don't like electricity? use candles! This is something deniers understand that most climate activists and scientists won't admit (and it weakens their case) which is that there really is no change that we can replace the concentrated energy of billions of years of sunlight in fossilized fuels with so-called renewable sources. It does not compute. So, since activists and scientists have been falsely promising the public that our industrial party can continue uninterrupted if only we install solar panels and wind farms, the message has been rejected...because it's just false. It almost certainly wouldn't work anyway because it's too late - but people who know this, and who know about amplifying feedbacks, have a moral obligation to state the truth - only by drastically lowering our consumption and population could we hope to stave off utterly disastrous and calamitous climate disruption. "... only by drastically lowering our consumption and population could we hope to stave off utterly disastrous and calamitous climate disruption." Utterly disastrous and calamitous climate disruption will make sure that we drastically lower our consumption and population. The former requires preemptive action, history teaches us that the latter is more likely to become true. Vroomie and Shoyemore thank you for the links. As a statistical decision theorist, I’m not convinced that ESLD should stop or even be reduced. The optimistic under-estimations of sea level rise, global warming, etc., identified by Brysse et al. are all exercises, albeit informal, in risk minimization (here, risk = expected loss). To explain: If one knows that an (optimistic) under-prediction of, say, 1% of the effects of climate change will result in a loss of x, whereas a (pessimistic) over-prediction of 1% will result in a loss of Ax, where A>1, then it takes a systematic under-prediction to minimize risk, & the degree of under-prediction needed depends on A. Of course, if individual climate scientists were the only ones to suffer when their predictions are wrong, then A would probably equal 1, so that they would want to report simply the most likely future effects as such. However, one could argue that the entire society will suffer more from over-predictions than from under-predictions, at least in the short- to mid-term, since over-predictions lead to those charges of “crying wolf” & thus a loss of confidence in climate science. So, ESLD might not be so bad, & might even minimize risk? scientists tend to invoke the "principle of least astonishment"
Whereas nature impartially invokes the principle of "cause and effect". Perhaps scientists should emphasise the most likely outcomes suggested by their research, rather than the least astonishing and not downplay the worst possible outcomes. Policy makers need accurate information, in order to increase the chances of making effective policies. The public need to be woken up, but I despair of discovering how to do this. Go comment on the thread about renewable baseline power. People who have looked seriously into this issue come to the opposite conclusion you do. Perhaps you could learn more about the available data. With respect to effective and timely action to address human-caused global warming, I've thought for several years now that your alternative description of cause and effect is inevitable. A significant nail in the coffin will be the likely result of the Australian federal election on 14 September this year, which will result in a government that intends to reverse, by effectively a decade or two at least, action to mitigate carbon pollution. I hope that there is serious, significant, and prominent scientific input in the coming debate, although Australia's media (including much of the ABC's news outlets) doesn't want logical, objective truth - they want a story, and the best story would be to change the government. There was a TV advertisement broadcast in Australia back in the 1990s (or perhaps earlier) where a grandfather and his small grandson are walking into the middle distance on a barren plain, and the grandson says something to the effect of "grandpa, what happened to all the trees? ", to which the grandfather responds with "when I was a lad we had these things called forests...". He followed with a description of the animals that lived in the forests, and I seem to recall the boy asking why the forests were allowed to be destroyed. At the end there was the inevitable message from the NGO that commissioned the ad, but I have to admit that the tail end of the content escapes me at the moment. Perhaps someone here has a better recollection of the piece, and might even be able to locate the video itself. I'd be interested to actually see it again, and it would probably be a good template for your project. This may be pushing the no political comments policy, but IMO, in the U.S. there will be effective action once things get bad enough (hopefully dust bowlism of the American Midwest will suffice) that permanently installed "World War Two Type Rules" for climate change action will be invoked. I will stop at severely rationing what is for most people a vacation luxury - round trip intercontinental jet flights. There is a long laundry list of such actions that would be necessary, but are no more draconian than done during WW2. I have recently read an interesting book – “Revolutie met Recht”. It is also available in English: “Revolution Justified” written by Roger Cox, a dutch lawyer. Although it describes the situation from a European perspective, I think it is interesting for everyone. Cox basically claims: democracy has failed. The largest multinational corporations (many of which belong to the fossil fuel industry) have an income that is bigger than the income of many nations, and therefore they also represent a bigger power than nations. This causes governments to become dependent on multinationals. Governments should represent the people who voted for them, but instead they only defend the interests of multinational corporations. Therefore, we must give up all hope that international politics will ever result in binding agreements to fight climate change. Instead, we should turn to the law. Governments have received the mandate from the public to defend the population against internal and external threats, and there is no bigger threat than climate change– perhaps it is even the biggest threat humanity has ever faced. We should sue our governments if they don’t take appropriate actions to protect their citizens. Whereas in the media the impression is given that the climate debate is not decided yet, in a lawsuit the scientific evidence is all that counts. In court, the IPCC is considered the ultimate authority on climate science. There is more than enough legal basis to win such a lawsuit. Bernard J, I've sent your words, in #19 to an Aussie friend of mine, who is *consumed* with hatred of Julia Gillard, and who has switched to the Liberal Party, in order to help Tony Abbott take over the reins of power. I'm saddened beyond words, but also agree that likely, we are going to kill a majority of ourselves off before learning. Permafrost and icecap melting is hastened by the movement of ocean heat from the tropics towards the poles by tropical storms. “Earth's poles are warming faster than the rest of the planet because of energy in the atmosphere that is carried to the poles through large weather systems.” NASA- What's causing the poles to warm faster than the rest of Earth? A paper entitled: "Artificial Upwelling for Environmental Enhancement" by a group from the University of Hawaii and Florida Atlantic University pointed out, ”The prospect of global climate warming will only mean more intense and frequent hurricanes, as they do not form in the North Atlantic when the monthly mean temperature is less than 26.8C over a minimum area of about 10 million square kilometers (approximately 3 square miles). As was suggested in this paper and by Ray Schmitt, Woods Hole Oceanographic Institution, "Assessing the potential of Ocean Thermal Energy Conversion(OTEC)", OTEC could provide this benefit. "It almost certainly wouldn't work anyway because it's too late - but people who know this, and who know about amplifying feedbacks, have a moral obligation to state the truth - only by drastically lowering our consumption and population could we hope to stave off utterly disastrous and calamitous climate disruption." Also we have no carbon budget so not sure where all the carbon to build all these renewables is coming from, blow this carbon budget and it is blown! Not to mention of course the large environmental impacts of renewables as well, bats, birds, warming the atmosphere, toxic waste, rare earth metals, batteries, mining, and so on and so on..
Power down massively or kill off humanity and lots of the biosphere to boot? Stop using fossil fuesl now or kill of humanity? Stop exploiting and over indulging in everything or kill off humanity? Stop having cars or kill off humanity? Stop waging war or kill off humanity? Stop manufacturing arms or kill of humanity? The carbon budget really is this tight. 350ppm still gives a 50:50% chance of 2C and look what 0.7C is doing. Permafrost tipped, Arctic tipped, Amazon getting dryer, carbon sinks are reducing, waters are warming, ice is melting rapidly, albedo affect is strong, and yet some are saying spend loads of carbon to build loads and loads of renewables despite the very large environmental and carbon costs they have? The choice really is power down or kill of humanity? Anyway it seems most feel that killing off humanity is the best choice or that is what their actions say anyway. Don't fly or kill off humanity.. The choice is ours, but of course not having a car or not being able to fly, would mean taking away basic human freedoms, despite the facts that these have existed for less than 1% of the time of human existence and therefore it seems to kill off humanity is the choice humanity is making, with eyes wide open even if the majority of humanity is in denial, that climate change is now, right now and a direct threat to us all wherever we live! re Jim Baird @ 24- I don't think that 10 million square kilometres is approximately 3 square miles. birds?! As opposed to the impact of domestic cats (orders of magnitude bigger impact). Toxic waste? As opposed to coal/nuclear. Mining? You're kidding, right? Fossil fuel extraction is done how? You might have a point about rare earths, but it depends on the specific technology - it's a much bigger issue for computing/telecommunications. And certainly on batteries - energy storage is the single biggest challenge... Solve that and we can produce all the renewable energy we ever need in favourable spots on the planet! You may not realise that the building of all those renewables (i.e. PV panels, windmills) does not necessarily require to burn fossil fuels to get energy. If we have some significant energy from the existing renewable infrastructure to boot with, the infrastructure can start expanding itself without need for "external energy". The only problem to solve, as skywatcher@27 noticed, is the energy storage. The Energy Returned On Energy Invested (EROEI) for wind and even PV is fine — within a short period of time (about six months for wind, 2-3 years for PV) both have repaid the energy invested in creating them and from that point on they are a net contributor to reducing emissions, even if they were originally created using the dirtiest coal power around. There are fossil fuels that are being exploited now (e.g. bitumen tar sands, shale oil) that have lower EROEI figures than PV and recent US oil imports have a lower EROEI than wind! I don't like suggestions that breakthroughs are "needed" for renewables to be viable. There are many other ways of storing energy, some even quite cost-effective and efficient, and I think over time they will simply keep improving incrementally as they have been doing. One of the best forms of "storage" is simply not burning the fossil fuel that you would have otherwise — coupling intermittent renewables with e.g. gas turbines (or low-load diesel generators, for smaller installations). A penny saved is worth more than a penny earned, as they say. Since cumulative emissions are what we really need to worry about, reducing the rate at which we burn fossil fuels gives us more time to improve technology and find other solutions. Coupling solar and wind with gas-powered backup can be a better option than not deploying renewables while we wait for all the problems that will occur as they reach higher penetrations to be solved. jimb - 26. Of course you are correct. Took quote directly from their paper http://www.clubdesargonautes.org/otec/vol/vol8-4-1.htm Would assume they slipped the million in there by error. I think recent scrutiny of climate science has forced the more outlandish claims to be reigned in and the science is actually much more responsible now. Yes, I see cats kill birds, so it is just fine to put wind turbines up as many as possible cos something kills more of them, and cats kill small birds whereas wind turbines kill top predator raptors which as I'm sure you're aware means eco-system derrangement so a higher overall biodiversity impact per bird killed by a long way. I do not adovcate coal, gas, oil or nuclear, all have far to many deep enviromental problems and none are sustainable, as I say " Stop using fossil fuesl now or kill of humanity?2 so is a lame argument to put unless you thought I was advocating fossil fuels. As for mining well no I'm not kidding where does all that iron, copper, rare metals, zinc, aluminium, and all the things that go into solar panels, I woudl suggest you look up solar panels and environmental toxicity in google. As bats well in a recent in Scotland small scale wind turbines reudced bat activity by 50%. Also there is lots very good evidence showing how wind turbines warm and dry the atmosphere in their locality, rather daft to put so many in wet old Texas really, and of course change the atmosphere here and the knock effects expand, and keep in mind to supply the power humans actually use would take removing all the powr out of the wind. And again there is no carbon to spend on wind turbines etc, and pay back false accounting by EROI or whatever are we have to stop using fossil fuels full stop asap, therefore what payback exactly if we don't use fossil fuels? Renewables are a carbon cost now to provide a certain amount of intermittently generated electricty into the future, and remember the carbon costs is not just the panel or turbine it si getting it there, all the extra grid needed and so on and so on. Again we have no carbon to spend and this budget cannot be blown, therefore for me I want to spend as little carbon as we can as wisely as we can, therefore I would want to have some renewable power and use the one that gives the most KWh out for carbon spent in so long as the wider environmental implications aren't too large. However again there is no carbon therefore this amount of aditional renewables would be very small indeed if we actually start taking this situation seriously, and to reiterate again renewables do not save carbon they are a carbon cost to give an amount of electricity and they have significant enviromental impacts all of them! "I'm saying no renewables I am saying see the for what they are and stop making them into false hereos they are not, look up toxic waste from solar panel manufacture etc...."
"I'm not saying no renewables I am saying see the for what they are and stop making them into false hereos they are not, look up toxic waste from solar panel manufacture etc...."
Jim Baird @30, whoever was the original source of the mistake, I think you will find that 10 million square kilometers us just approximately 3.85 million square miles. Proper form also requires that if you cut and paste text, you enclose the quote in inverted commas, and provide a link to the source. BF @31, the most outlandish "scientific" claims in the global warming debate have always come from deniers; and as they get a pass from critical scrutiny, both by themselves and the media, there has been no let up in the absurdities. Renewables currently also take fossil fuel to build, and that’s exactly why an global carbon tax is needed. Randomly distributing emission rights to whoever needs to emit CO2 for whatever reason will never help to get climate change under control. When a worldwide carbon tax is introduced, IF renewables use fossil energy in some way – during building, or for transportation etc, they will be penalized as well by the carbon tax. As it should be. It truly levels the field. The result: the cheapest electricity = the most carbon-neutral electricity. "Also there is lots very good evidence showing how wind turbines warm and dry the atmosphere in their locality, rather daft to put so many in wet old Texas really, and of course change the atmosphere here and the knock effects expand, and keep in mind to supply the power humans actually use would take removing all the powr out of the wind." "...wind turbines kill top predator raptors which as I'm sure you're aware means eco-system derrangement so a higher overall biodiversity impact per bird killed..."
"[sic] As bats well in a recent in Scotland small scale wind turbines reudced bat activity by 50%." It would be helpful and oh-so-ever more scientific to back up your opinions with data that shows they are valid opinions. BF - I am curious. What outlandish claims are you thinking of that have been published in science (as opposed to say Greenpeace)? BF - I am curious as well. Can you cite any specific claims that have been "reined in," so to speak? I provided a link to a post here on cumulative emissions specifically because the science tells us that we do not have to stop all forms of carbon emission immediately or we're toast. Yet your subsequent post repeated this erroneous claim as if you hadn't followed the link. Please read it. The fact is, the more we emit in the long run, the higher the risk of dangerous climate change. But it's far better to invest some short term carbon use into long term carbon reduction (e.g. manufacturing PV and wind turbines) than to continue business as usual while moaning that people keep on emitting carbon and refuse to live in caves. There are a lot of people in the world who could quite rightly claim that they are entitled to higher levels of energy consumption and better standards of living because they weren't the ones who caused the current problem by doing so in the past. We have to expect them to continue to want to do raise their standards of living. What we can do is invest in technologies that will allow them (and us) to do so while emitting as little carbon as possible. Renewables are one way forward; efficiency is another; curbing to some extent the wasteful lifestyles of the developed world is probably a third. But let's invest the carbon budget that the science tells us we do have wisely. I don't think anyone is saying technology is a 'hero'. All solutions have their bad points and new technology requires time to mature and develop. But you have to use it first before you can fix the problems. For instance, would new radar have been developed to handle the problems of wind farms, if wind farms had remained on the drawing board and had never been constructed? The answer is no. Would we have rules and guidelines about electricity installations if we hadn't started installing electricity in homes? The answer is no. Deploying any new technology will mean something or someone will lose out. But given that humans are extremely unlikely to give up technology and knowledge, then you have to deploy the technology that does the least damage. Renewable energy is the compromise between human self centred desires and and the need to do minimum damage to the environment that provides resources to create those desires. Regarding birds, cats and wind turbines. I recently did a back of the envelope calculation and worked out that if all of the electricity in the USA was generated by wind energy, the number of birds killed by the turbines would still be negligible compared with the damage pet cats do, or even buildings and other human built structures. If you had to draw a bar chart, wind turbines wouldn't register on the graph when compared with the bar for pet cats. Also in the UK the biggest danger most raptors have is from a human armed with a gun. There is a growing bank of knowledge regarding bats and birds now and wind farms, so numerous solutions and guidelines are being drawn up. Following up on the cite by Paul D is this article from the BBC which covers the bat study specifically. It sounds like the one Ranyl was referring to. It recommends minor adjustments in location of home wind turbines. This does not appear to be a serious problem for bats. Are there any citations that suggest wind turbines are a serious problem for bats? When wind turbines were first deployed there was a lot of noise about raptors. I have heard little of that in recent years. Can current data be cited by those who think this is a problem? In my browser (Firefox) the preview option is gone. I like to check to ensure links are OK. Spelling errors are also not underlined. Moderator Response: TC: You may not have noticed, but SkS comments have now been converted to WYSIWYG. The second tab allows inserting links, pictures and tables; or if you insist on doing things the hard way, you can use the third tab, and edit in source. No doubt more information will be forthcoming soon. JasonB @40: I agree. The conservative thing to do at this point is to treat fossil fuels as an endowment. They are the capital that bootstrapped modern society into being; now we should live off the dividends rather than plunder the principal. We don't have to go back to living in caves (and obviously there aren't enough to go around), but we do have to reserve fossil fuel use for those applications for which there are no reasonable substitutes. Reasonable is not the same thing as economic. Economics without a carbon price are false. For example, we can make a car that doesn't use fossil fuels. It's not cheap in today's economics, but the value would be commensurate with its true cost. Which would mean that car ownership would be pretty limited. Which would mean a basic transformation of social structures and relationships. Same thing for electricity. We can still have it. It'll just be in much smaller amounts until we can do the R&D that extends our non-fossil capability. This R&D would be one of the uses of fossil fuel for which there is no substitute--though it would need to be transparently managed and subject to oversight. We can do these things willingly, or we can continue to waste our endowment and end up like many a trust-fund baby: depleted and unable to cope with the remainder of our now-pauperized existence.